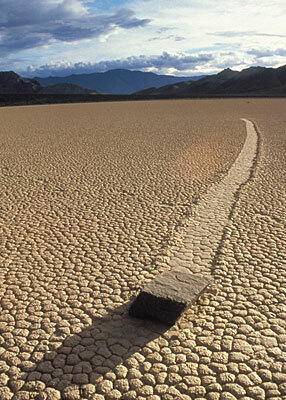 It is one of Death Valley’s most intriguing geological whodunits — the sliding rocks of the Racetrack Playa. On an ancient lakebed located on the western side of Death Valley National Park, boulders that weigh up to 700 pounds sail across the almost perfectly flat terrain, leaving grooved trails in their wake. As NATURE’s Life in Death Valley shows, each of these furrows chronicles a rock’s journey, ranging from a mere few inches to nearly 3,000 feet. Some tracks manifest in straight bold lines, while others coil back on themselves in sinuous arcs. Though no one has yet been able to conclusively identify just what makes the rocks move, one woman is coming closer to solving the mystery. For the past ten years, Dr. Paula Messina, professor of geology at San Jose State University in California, has made it her quest to understand what has bewildered geologists for decades. “It’s interesting that no one has seen them move, so I am kind of sleuthing to see what’s really going on here,” says Dr. Messina. Many scientists had dedicated much of their careers to the racing rocks, but the remoteness of the area kept their research limited in scope. No one had been able to map the complete set of trails before the advent of a quick, portable method known as global positioning. Dr. Messina was the first to have the luxury of this high technology at her fingertips. In 1996, armed with a hand-held GPS unit, she digitally mapped the location of each of the 162 rocks scattered over the playa. “I’m very fortunate that this technology was available at about the same time the Racetrack captured my interest,” she says. “It took only ten days to map the entire network — a total of about 60 miles.” Since then, she has continued to chart the movements of each rock within a centimeter of accuracy. Walking the length of a trail, she collects the longitude and latitude points of each, which snap into a line. She then takes her data back to the lab where she is able to analyze changes in the rocks’ positions since her last visit. She has found that two components are essential to their movement: wind and water. The fierce winter storms that sweep down from the surrounding mountains carry plenty of both. At an elevation of 3,700 feet, strong winds can rake the playa at 70 miles per hour. But Dr. Messina is quick to point out that sometimes even smaller gusts can set the rocks in motion. The explanation for this lies in her theory, which links wind and water with yet another element: bacteria. In science, hypotheses are often based on logic. But over the years, Dr. Messina has discovered that on the Racetrack, logic itself must often be tossed to the wind. “Some of the rocks have done some very unusual things,” she says. In her initial analysis she hypothesized that given their weight, larger rocks would travel shorter distances and smaller, lighter rocks would sail on further, producing longer trails. It also seemed reasonable that the heavier, angular rocks would leave straighter trails and rounder rocks would move more erratically.